An inspiring story of resilience and the power of optimism–the true story of Alice Herz-Sommer, the world’s oldest living Holocaust survivor, and the pianist who was the subject of an inspiring You Tube video that moved millions of viewers. At nearly 108 years old, the pianist Alice Herz-Sommer is the world’s oldest Holocaust survivor. An eyewitness to the entire last century and the first decade of this one, she has seen it all, surviving the Theresienstadt concentration camp, attending the trial of Adolf Eichmann in Jerusalem, and along the way coming into contact with some of the most fascinating historical figures of our time. As a child in Prague, she spent weekends and holidays in the company of Franz Kafka, whom she knew as Uncle Franz; and Gustav Mahler, Sigmund Freud, and Rainer Maria Rilke were friends of her mother. When Alice moved to Israel after the war, Golda Meir became a friend and attended her house concerts, as did Arthur Rubinstein, Leonard Bernstein, and Isaac Stern, and she was friendly with Daniel Barenboim, whom she heard play when he was just a child. Today Alice lives in London, where she still practices piano for hours every day. Despite her imprisonment in Theresienstadt and the murders of her mother, husband, and friends by the Nazis, and much later the premature death of her son, Alice has been victorious in her ability to live a life without bitterness. She credits music as the key to her survival, as well as her ability to acknowledge the humanity in each person, even her enemies. 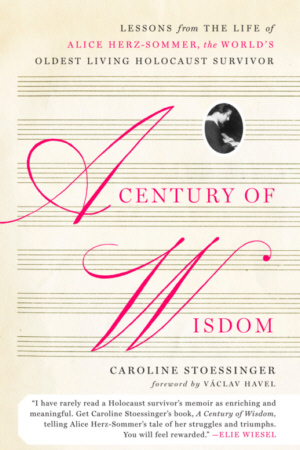 A Century of Wisdom is the remarkable and inspiring story of one woman’s lifelong determination–in the face of some of the worst evils known to man–to find goodness in life. It is a testament to the bonds of friendship, the power of music, and the importance of leading a life of material simplicity, intellectual curiosity, and never-ending optimism.